On June 6, 2013 Gaylene Goodroad of the Discernment Research Group posted on the Herescope blog a series of articles, with a lead title Techno-Dimensional Prayer Combat. It is well worth one’s time to consider the contents of the Herescope blog, if you are interested in an in-depth analysis of the theology undergirding much of the Christian Alternative Media. This theological view has been given the designation of Postmodern Prophecy Paradigm, or PPP by authors Gaylene Goodroad and Sarah Leslie, who have researched numerous books and articles written by the proponents of this viewpoint. 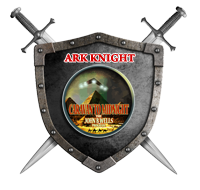 It includes those ideas advanced by Tom Horn, David Flynn, Paul McGuire, Steve Quayle, Russ Dizdar and other like-minded individuals. However, what I want you to focus on right now, is an interesting story contained in Goodroad’s article involving L. A. Marzulli and Russ Dizdar. Both of these men are on the speaker roster of the 2016 Hear The Watchmen conference scheduled for Dallas next month. The theme of this conference is that of a Crusade, with instructions to Saddle For Battle. Thus I will begin quoting Gaylene Goodroad’s article at the paragraph marked by the subtitle, Preparing To Engage Quetzalcoatl In Battle. As you consider the false bravado of L.A. Marzulli, Russ Dizdar and their entourage who thought they could withstand the Mayan god Quetzacoatl, but ended up shaking with fear because of a daughter’s nightmare, so that God’s will was quickly cast aside, let us fast forward to events of this past week in this Alternative Universe. 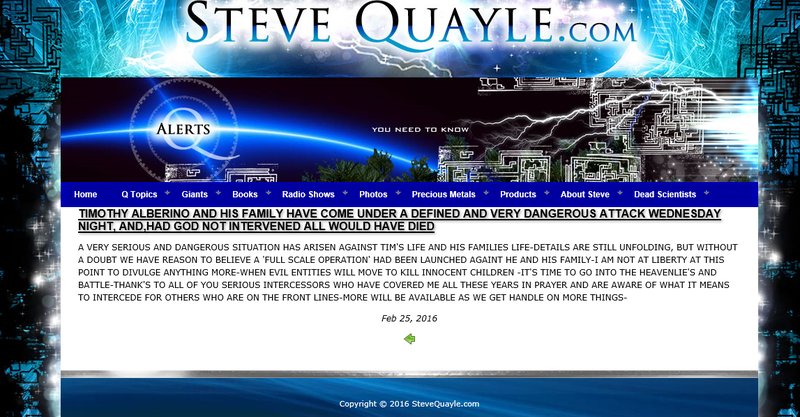 The following QAlert was sent out to millions of readers of Steve Quayle.com on February 25, 2016 concerning an incident which was said to have occurred the evening before. Now if this report is true, we are in agreement with Steve Quayle, that this attack on Timothy Alberino and his family is unconscionable, and needs to be resisted both by prayer and other types of actions. The problem, of course, is that similar QAlerts have been issued in the past by a hysterical Steve Quayle, who afterwards leaves his readers wondering what really went on. I am especially curious what Quayle means by a full scale operation had been launched. His reference to Wednesday night would be February 24, 2016, and as I note in the next paragraph, Intercessors are pushed to the forefront of the February 25, 2016 Paul McGuire interview on the Hagmann Report. 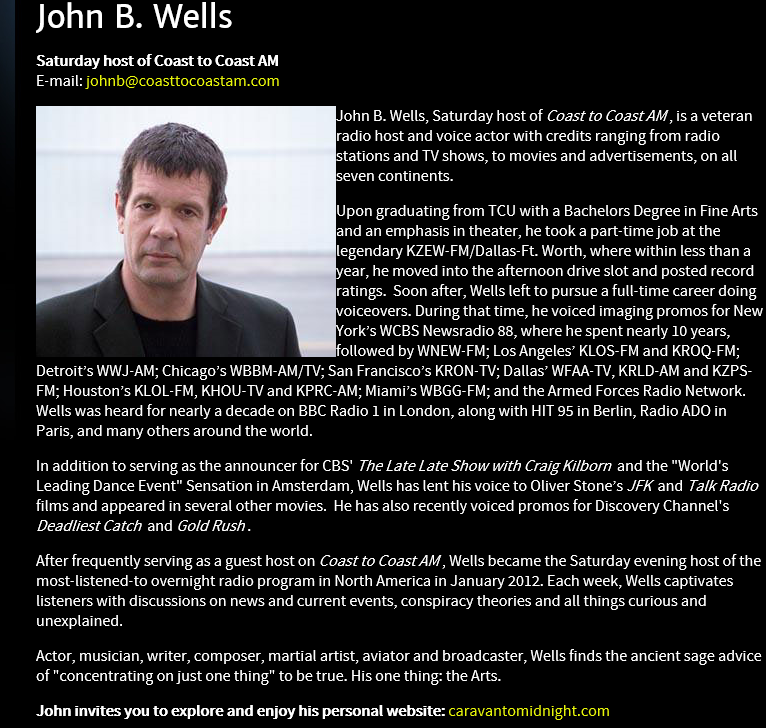 This particular interview centers heavily around Paul McGuire’s latest book, and also his upcoming speaking engagement at the Hear The Watchmen conference. While McGuire says that he spends many hours a day researching, what he actually offers up for discussion are certain themes boringly common to most Alternative Media discourse on the internet. It is as if the so-called Christian Alternative Media has set up a Windmill with the blades of Illuminati/Communist/Nazi/Main Stream Media influences on our nation, which these Don Quixotes in turn attack, in fulfillment of some strong delusion that they are God anointed Watchmen. Paul McGuire, who bills himself as a Senior Pastor of a local church whose physical location he refuses to disclose, also wants us to believe that he is an internationally recognized prophecy expert. And of course he is altruistic to the max, stating at the beginning of this interview that he is not getting paid for the interview, and does not want any compensation. He also says that it took him years to get where he is today, influencing millions to listen to his “gospel”(translate DONATE) cause. One of the tiresome qualities of the friendships of these men in the Inner Circle of Trust is their constant flattery of one towards another. And this interview reeks to high heaven with Hagmann’s over-the-top heaping of praise for McGuire and his latest drivel in book format. The other day I read a comment from a woman on another blog which asserted that Doug and Joe Hagmann and Dave Hodges were only babes in Christ, and therefore exempt from critical scrutiny. 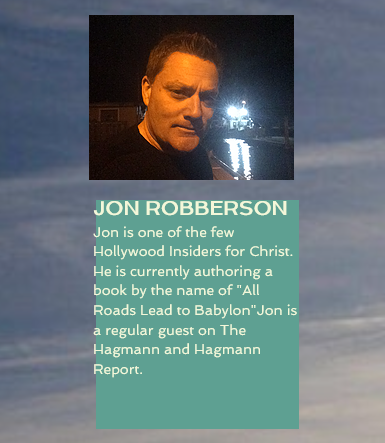 So I am glad to report that Doug Hagmann “got religion” in this interview, pausing a couple of times to give explicit directions to the Intercessors to pray for Paul McGuire. Normally, this is something that we are used to Steve Quayle doing; but tonight it is Hagmann who is letting the world know that spiritual warfare intercessors are listening to the broadcast and interceding. Paul McGuire espouses a theology which places a heavy emphasis on the Supernatural Powers of God, which he says can be downloaded by the believer just as one downloads computer Apps. Leading in a prayer for America near the end of the interview, he said that those who had joined him in prayer that night and have the spirit of God would feel a resonating in themselves. This sounds similar to what the Mormons identify as the burning in the bosom, a confirmation sign of the presence of God. If one reads the testimonies of many Charismatics, their beliefs are often founded on manifestations, rather than on the words of God. To this the Bible gives warning in 2 Thessalonians 2 that the mystery of iniquity, “whose coming is after the working of Satan with all power and signs and lying wonders” is allowed by God as Strong Delusion to be sent to those, as a damnation, who believed not the truth, but had pleasure in unrighteousness. Doug Hagmann at one point in his interview refers to Paul McGuire as The Tip of the Spear. 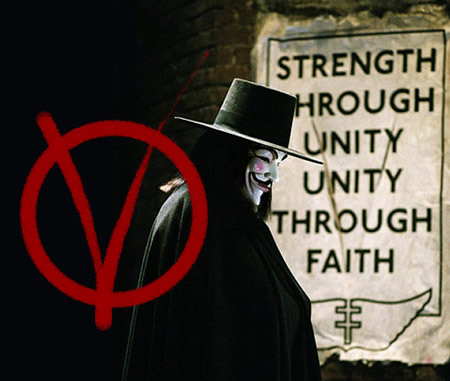 And again he reiterates the Hear The Watchmen Crusade call to action, to Saddle For Battle! The last few minutes of this interview are dedicated to reproving those who have blogs and webpages “devoted to criticizing the brethren”. We must note here that while the Hagmanns and McGuire retain the right of free speech for themselves, they do not consider that their detractors retain the same rights. Consider for a moment that the Hagmanns and McGuire claim to reach millions with their words. How many blogs are there at this moment actively critiquing the words and deeds of these noble Watchmen? And how many readers do these blogs actually have? In the past couple of years, there were at least a half dozen blogs which had written articles on this particular Inner Circle of Trust. Most of these writers are presently busy with other matters. Of interest is that Tom Horn’s book, Blood on The Altar directs its venom against those who have written against a group of men which form the PPP, the Postmodern Prophecy Paradigm. The primary researchers and writers who undertook this daunting task are Gaylene Goodroad and Sarah H. Leslie of the Herescope blog. Unlike my blog which critiques the outer layer of deceit, the Discernment Research Group of Herescope delved into the depths of these false prophets, watchmen, and authority figures. Back in 2011, after confronting face to face, a series of men who were complicit in a spiritual attack which had been conducted against my young teen daughter, I began a blog called Starlitgardens. It had one reader who I personally know, who is a Defender of the priesthood of the leopard Meroz. Later it seemed I had two readers, and I wondered if there were actually two persons, or just one disguised as two. Later, I got tired of the bantering about of occult stuff, and I erased all those posts, and Starlitgardens became a blog to post sewing, gardening and painting projects and miscellaneous family photos. In 2013 I began this blog, Tracking the Leopard Meroz, with the intent of examining some things in my own background which led to my tracking of a sorcerer who is a Master of the Numbers of the Scriptures. This sorcerer is like Balaam, who was hired to curse or bless others. One of the real persons I faced off with in Texas claimed responsibility for causing the rash of teen suicides in Plano, Texas years ago. Well, I dabbled around with several things on my blog, and then there was a six month period when I wrote nothing. Outside of this blog, I like to spend time with family and neighbors and church folk, garden, cook, clean, babysit, sew, paint, do volunteer work, laugh, look at the stars on a clear night, slosh around the beaches on the gulf coast…..
And then in February 2015, I began to observe the Christian Alternative Media closely. But by the end of 2015, I decided to walk away from this tiresome mess, and began to write a book on my blog called The Art of Guileless Guile. However, in January of 2016 the Nathan Leal/Broer controversy surfaced, and I decided to flow down this river a bit longer. At this point my readership has grown to a maximum of 143 per day. It is hard to gauge how many individual regular readers I have, as some people check in once a week or once a month. When a couple of days ago, I received an email from someone which asserted that it was my blog which the Hagmanns and McGuire were complaining about in the February 25th interview, I was surprised. Now here is a curiosity: a couple of days ago I received 54 troll-type comments; some of which were pornographic and threatening. Thirty-two of these comments were attached to the Paul McGuire, Pastor of the Mailbox Church article, one was attached to a Nathan Leal post, and the remaining were attached to my John B. Wells/Doug Hagmann post. At the same time a man shoved his way in front of me at the grocery store in an intimidating manner. As I had just said hello to a lady from church, I was caught off guard, so when this person “got in my face”, I reacted by walking away. And now someone is claiming that I am the thorn in the side of the mighty Christian men of the Alternative Media. 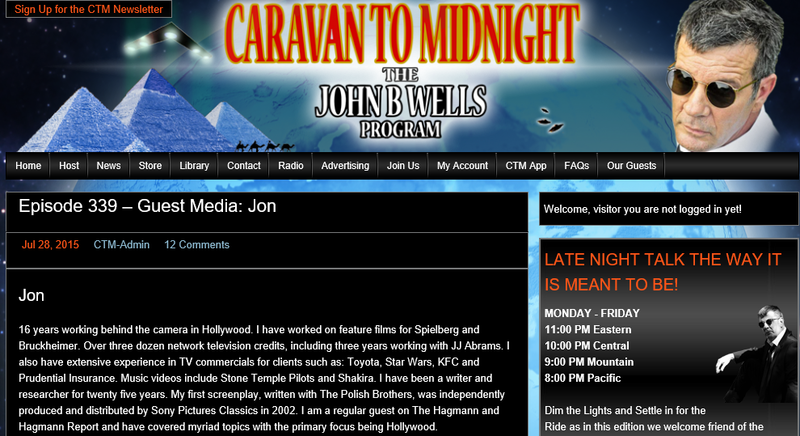 Compared to the webpages of the Hagmanns, McGuire, Quayle and others, my little blog is just a little cork floating in an internet ocean. Rather than addressing the issues I bring up regarding their PSY-OP methodologies, these Watchmen continue on, and on, and on, tempting God to judge them. The one thing which shocks most people who have first heard of my “reputation” and then later meet me face-to-face, is that I am a soft spoken, shy person. The battles which I have personally had to engage in over the years were entered in by me, only because there were no other defenders, and I had been backed into a corner. By temperament, I am not a fighter. That I have held my own against wicked men is a surprise to me, and a display of the grace and mercy of God. It would appear that all Christians, and even the least, which I am, are required to stand and withstand in the evil day. If I had to name one main motive behind the writing of this blog, it is to encourage Christians to develop their critical thinking skills and to learn to stand alone, if necessary, for Christian truth. For those of you who will be attending the Crusade-Saddle for Battle conference in Dallas, have you remembered to check with the hotel about accommodations for your horse? There may be restrictions against Old Nellie (I am not talking about your wife!) sleeping in the same room as you, in that extra queen sized bed. A reminder that the All-You-Can-Eat Salad Bar is for people only. THINK! As Steve Quayle is always saying, People just don’t understand…This is Critical!!! And rumor has it, that he will not be attending this event. Rick Wiles: Steve, what was the first thought in your mind Saturday, when you heard the news that Justice Scalia had passed away? SQ: Yes, Sir. MURDER. There is a reason I say that is because again the Supreme Court is probably one of the most volatile positions now, that had needed a change. And as the headlines progressed through the early hours of ah you know my becoming aware of it, and all the different stories being told, obviously they said it was natural causes. Whenever I hear instantly natural causes, I go auhh, auhh. Because it’s like the preparation, or the headlines have been prepared in advance. Then we watch the whole thing unfold, it wasn’t a heart attack. Remember, they said it was a heart attack, how can you determine a heart attack without an autopsy? RW: He was pronounced dead over the telephone. How does the coroner get there and pronounce somebody dead by doing it over the telephone? Are they doing it by Skype now? SQ: Well, I think ah you know that the obvious statement is there was an expectation – the question that has to be asked, who stood down the Secret Service, that has the job of protecting Federal Judges? But you know, Rick, MURDER is MURDER INC. now and it’s MURDER OF THE DAY. Obviously, now we find that he had a pillow placed over his head. But there is also other discrepancies, and I think it is a tragedy and a travesty that the highest judicial, and known as a Conservative, Catholic, by the way, is MURDERED. And now anybody who makes a statement is considered or deemed to be a ah domestic terrorist. RW: What are some of the other discrepancies you’ve heard about? SQ: Well, first of all I think the way the bed was presented, ah you know he basically laid down and have given the, if you will, the nature of the CRIME scene, the different stories that are relating to how he died, the absolute out of character ah response of coroners, of the press. Everything was pre-staged. And I think that that’s what’s troubling to me the most, Rick, because again I think that there’s really something here, OK. The pillow is left over Scalia’s head and obviously if you want to cover up a CRIME scene, you would have removed it. Hands look peaceful like he folded his hands like there was no struggle and what’s interesting is that ah someone who may have done this may have straightened the bed. I would think if you’re having a heart attack, unless it’s instantaneous, that there would be more mussing of the covers. Now the other thing I find it interesting is the family’s not insisting that an autopsy, and you know this is troubling to me, because again it’s like I don’t know if someone has been threatened or whatever, but if the sheets aren’t rumpled, and you know no one that I know goes to bed and lays their hands down on their chest, and I’m just saying that again it was reported that it was a heart attack – no autopsy. The coroner reports it over the phone. The owners of the ranch are talking about different statements that are being contradicted in the main stream press. So this is a Classic Cover-up. By the way when I was up I got an email from Marshall and, and, the words that came to my spirit, Rick, this is critical, you know again, Weep America. Weep. Your nation has become stolen from you. 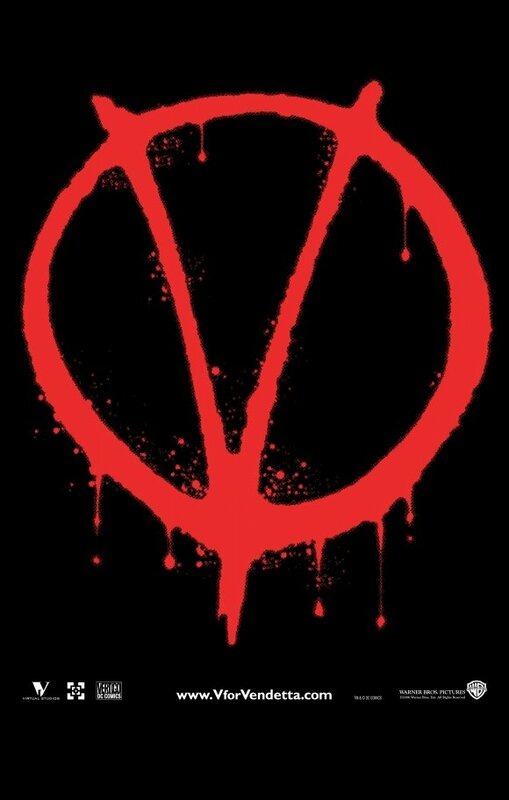 You have become a nation of MURDERERS. Now that’s really heavy, OK? That’s REALLY heavy. RW: I wonder if the pillow was checked for chloroform. SQ: Well, it could be due to, listen, they have a million ways to kill you. Andrew Breitbart was..
SQ: And Breitbart was hit with a psychotronic weapon. You know they, they had Senate hearings in the seventies on heart attack weapons, you know. I know a talk radio show host that got zapped with one and he made it through. SQ: And if people remember, Tom Clancy was also killed under mysterious circumstances, and Tom Clancy had made a similar statement. RW: Somebody did kill Justice Scalia. Why did they leave the pillow on his face? But you know, Rick, this has all the classic overtones of the octopus like tentacles of ah anybody that could stand in the way of the destruction of the United States and I want to point something else out to everybody last week……(discusses how the news of Scalia’s death caused him to stay awake all night)…But Scalia, this is such an in your face statement that We’ve got the country. And I think that’s whats tragic. If there isn’t a screaming, if there isn’t a demand for autopsy, if there isn’t an independent investigative arm, then you know this – then you know that basically the statement has been made from the people behind this that We can kill anyone anytime anywhere and there is nothing you can do about it. RW: It has all the hallmarks of a fascist police state. SQ: Well you know we have, ah, I have maintained the Nazis never lost the Ha Ha! – lost World War II. The above is a partial transcription of about eight minutes of an audio published at TRUNEWS on February 15, 2016, called STEVE QUAYLE-THE DEATH OF JUSTICE. Rick Wiles sets up a question from the very start, to which Quayle answers MURDER. We are dealing with a scripted dialogue which sparks the listener’s imagination into accepting a judgment without first hearing the evidence. I have entitled this propaganda piece MURDER HE WROTE, and highlighted some of the highly charged word components in blood red. Rick Wiles plays the part of Inspector Clueless. Steve Quayle, plays the part of The Obituary Columnist of TRU-Lies NEWS, and after immediately tossing the MURDER card on the table, the imaginations of these two men run wild. The very real possibility that Justice Scalia might have passed away quietly due to his advanced age of 79, and declining health, is cast aside. The possibility that the family, who believed that they were dealing with a natural death, wanted to make sure that persons in the Alternative Media were kept away from private family matters, is never given any credence by Wiles and Quayle. And you will note that neither men properly honored the memory of Justice Scalia; he was just a prop piece in this propaganda play. Rick Wiles and Steve Quayle engage in much Pillow Talk, and Steve Quayle tells us that his spirit gave him yet another revelation of the destiny of America. Possibly becoming terrified of his own pillow, we are informed that Steve Quayle lost a whole night’s sleep over this news report. When they run out of facts on Scalia’s death, they bring up the old conspiratorial theories which were proven unfounded, as to the causes of the deaths of Andrew Breitbart and Tom Clancy. Does anyone remember who shoved these strange murder theories in our face, in the first place? Why it was none other than that Alternative News con man, Jim Garrow, who the last time I had heard, had been placed under house arrest. If you have forgotten who he is, I will refresh your memory with this article. Jim Garrow claimed to be a former CIA agent, but there are those who consider him to be a fraud, and think that the real CIA ought to investigate him for unlawful impersonation. Jim Garrow wrote a book called The Pink Pagoda, which is reviewed here in depth by Research-China.org. This book review is thoughtful and thorough , and mentions an interesting character in the book called Yoda. Does anyone recall the series of talks given a couple of years ago by a mysterious operative called Yoda on The Hagmann and Hagmann radio show? Jim Garrow, and therefore Yoda by implication, have been accused of child trafficking in China. Here is an article by the Teapartycrusaders.com who wrote on February 22, 2015, INCREDIBLE: Ex-CIA Agent claims Obama had Breitbart and Clancy Killed. There are many more such articles on the internet with regard to Jim Garrow, if you want to read further about this man. In the audio, Steve Quayle-The Death of Justice, Rick Wiles and Steve Quayle have made an astounding assertion of MURDER without any evidentiary proof. And because of the lack of facts, they interject into their accusation a bunch of unfounded accusations made in the past by Jim Garrow. We observe the relationship of Garrow and a government operative named Yoda. All of these men have had a close working relationship with Doug Hagmann. And finally, note that Wiles and Quayle declare America to be run by fascists and Nazis, which of course leads into promoting Steve Quayle’s most recent book. If you look at the script of MURDER HE WROTE, Steve Quayle is trying to use this platform to inject fear into someone; other Federal Court judges, perhaps? Other people he personally dislikes, who refuse to be silenced, because they have evidence of wrongdoing? These men have not honored the memory of Justice Scalia. What they have done is to use his death for their own self-serving base motives. Certainly, they could have examined all sides of this story in an objective manner, without coming to the conclusion that this death could only be MURDER. UPDATE: 2/18/2016 Someone just emailed me this article on the pillow controversy. UPDATE: 4/28/2016 A reader sent me these two links on Prazor, the new platform which Rick Wiles was creating at the time of this article, and which was obliquely referenced in paragraph one. The link to this trademark is found here. 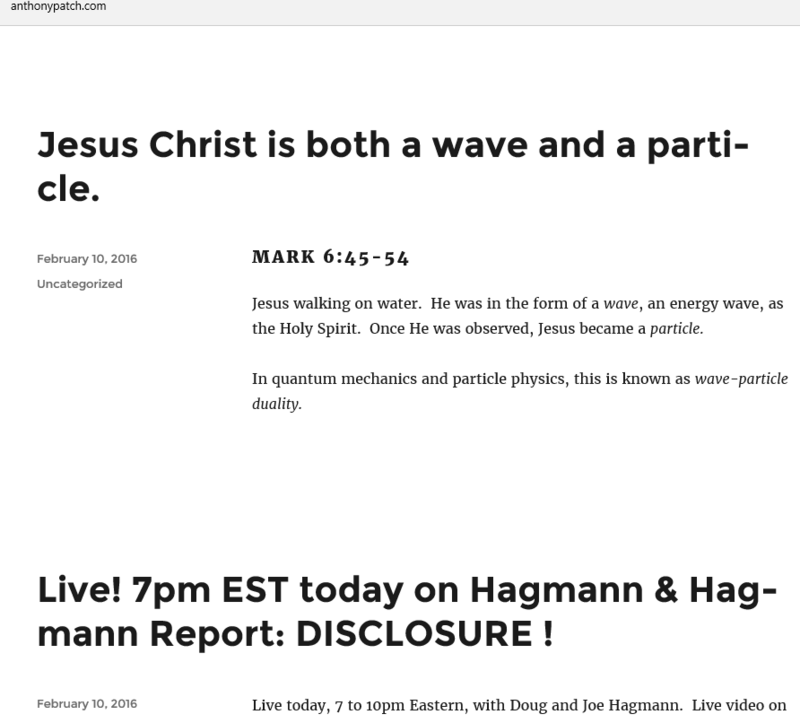 The other day, I endeavored to listen to the first two hours of the February 10, 2016 Hagmann Report called CERN, Extra Dimensions and Portals with Anthony Patch. Ever since CERN failed to blow up the world last September, and Steve Quayle had quietly removed his CERN icon from his website, the question must be asked, why is Doug Hagmann now recycling Anthony Patch through yet another portal? I had never heard of this guy, so I looked up Anthony Patch.com to check out his About page. Oh, there is none. Referring to himself obliquely as a Researcher-Author-Speaker, he evades the question as to his educational credentials in physics or mathematics. So it is off to LinkedIn, where Anthony Patch has uploaded his photo and personal data. Let’s see, in 1972-4 Anthony Patch took courses in Criminology at UC Berkeley. Then he found employment from 1980-1997 with American Medical Response. During that same period in 1985-6, he took paramedic courses at the College of San Mateo. In 2003-4, he worked for the Bank of America, as a Loan Officer (Loan origination/processing, Marketing/Sales, Investor Seminar Leader). Since 2010 Anthony Patch has been working for Home Depot as a Department Supervisor. He describes himself as “outgoing, ‘open-book’, goal-oriented, and considerate of others”. 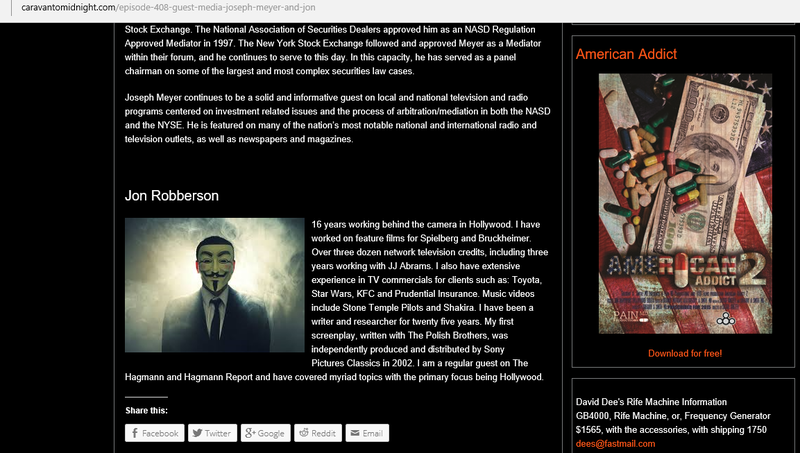 On Anthony Patch’s webpage, he devotes a separate page to what he calls My Unique Identifiers and Quotes. These are phrases and sentences which are his talking points for his CERN, Portals, Disclosure, Quantum theory discussions. For example, he quotes himself saying You cannot separate the spiritual from the physical. Well maybe you can’t, Anthony Patch, but upon your death, you will discover that God can surely separate the spiritual from the physical. Another one of Patch’s unique identifiers is his saying that Jesus Christ is both a wave and a particle. When He manifests himself physically to us, he is a particle. His energy wave slows to form a particle in our frame of reference. The Scriptural verses and his comments are shown in the screenshot below: As you notice, he posted this “profound” assertion the same day he was featured on the February 10th Hagmann Report radio show. So what is he trying to impress us with, that Jesus Christ is the Unified Theory of Light? Do you think it is possible that Satan can also be perceived as a spirit which can walk on water? Here is another declaration of Anthony Patch’s: Prayers with Jesus Christ is quantum entanglement of our particles with Him. In the same vein he also says, Prayer is quantum entanglement with Jesus. How does this edify the body of Christ? Does this assertion give you added comfort and insight when you pray? Is there a difference between praying to Jesus, and praying with Jesus? The first reverences his Divinity; the second suggests that we have an equal standing with Christ. Anthony Patch, by intertwining his quantum physics slang with the words of God, is playing a dangerous word game affecting faith. Romans 10:17 says, So then faith cometh by hearing, and hearing by the word of God. And John 8:47 warns, He that is of God heareth God’s words: ye therefore hear them not, because ye are not of God. It is one thing to learn a new language involving scientific thought; it is another thing entirely, when that new language begins to subtly alter how you read and understand the Scriptures. In the Bible, Jesus Christ used ordinary experiences and common language, so that even a child could understand his words. The language of quantum physics has over the past few years been intertwined with New Age and occult theology; therefore its import, when overlaid upon the words of God, should cause alarm in the heart of the Christian. Anthony Patch, says on LinkedIn that he lives in Portland, Oregon. That might explain how he got some of his early publicity from Clyde Lewis of Ground Zero Radio, who is well known in the paranormal, conspiracy world. Wikipedia has an entertaining article on Lewis, and the relationship between Patch and Lewis is tantalizing to consider. It seems that both men on the same day, in separate incidents, claim that they were visited by Men In Black. 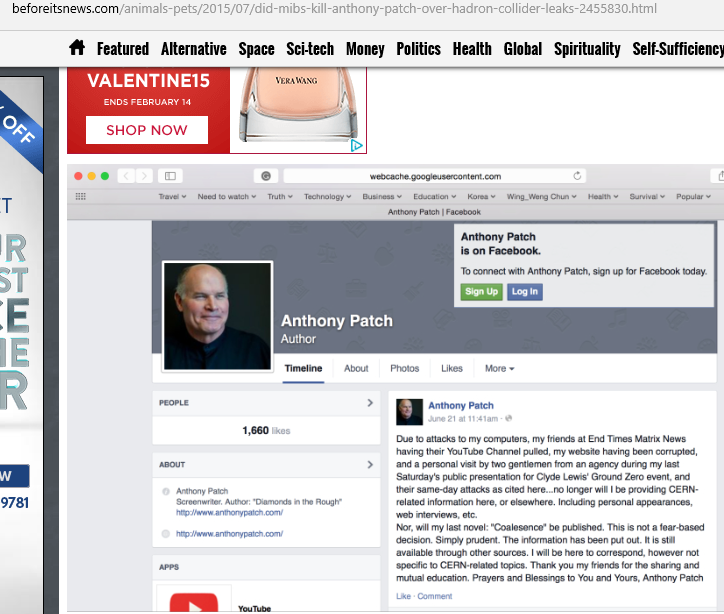 So let us continue on to an article published July 2015 in Before It’s News, which displays a message that Anthony Patch had left on his old Facebook page June 21, 2015. 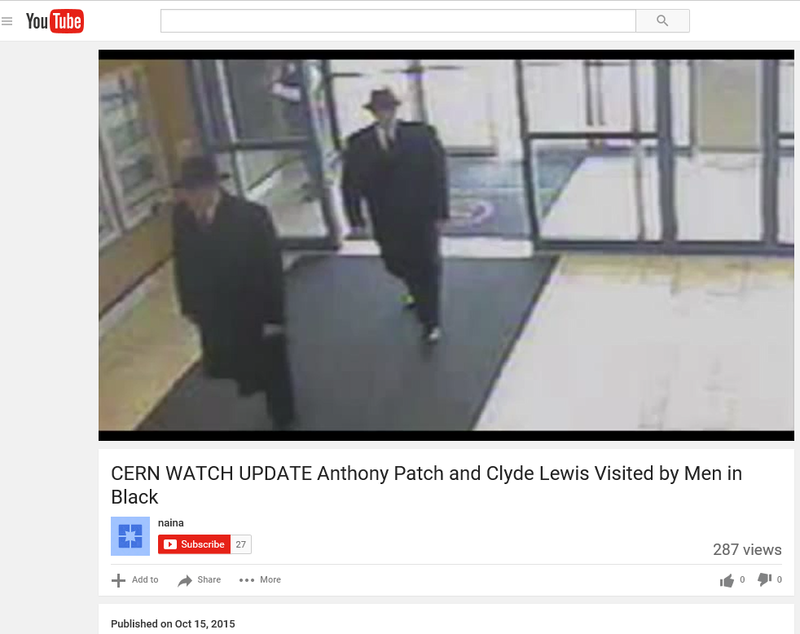 Here is a link to an article written by the jasperandsardine.wordpress.com blog, titled The CERN Code: Anthony Patch Is Visited by Men In Black? This is an interesting background piece, and it contains a short 15 minute audio at the end, where the MIB story is related. After the Men In Black were reported to have visited Anthony Patch, he went into invisible mode on the internet. Apparently a couple of persons became very worried that he was missing and/or dead. But there was no need to panic; soon after, as the world of conspiracy began to spin rumors about CERN and the September 23, 2015 predictions, Anthony Patch reappeared. 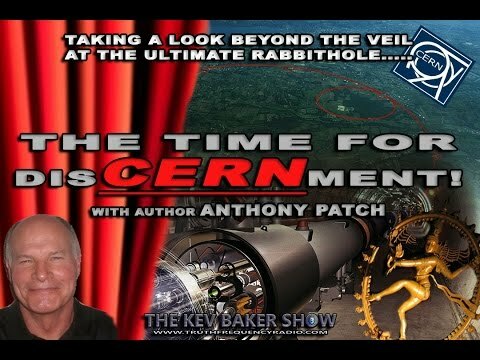 Voicing his concern about the disinformation being disseminated on CERN, Anthony Patch risked his life to again carry on his mission in the world of “Christian” Alternative Media. On Anthony Patch’s website, he sells three e-books for between $5 and $15. He also has a separate page for his paperback novel Covert Catastrophe, which he sells for $29.99 at Lulu.com. I see that no one has reviewed this book at Lulu’s. So I go over to Amazon.com to see what eight people (six of whom are probably Patch’s friends) think of this novel. If you are rich, you can buy 2 used first edition copies at $1,037.41 each. Or if you want to become book-poor, you can get a new November 23, 2015 edition for only $28.29. Since I buy things from Amazon.com UK for my grandchildren in Scotland, I also checked the 2 reviews there. One Brit had an interesting reaction, as shown here. I wonder if anyone in the USA is as succinct as D. Mitchelson. Here are two negative reviews reflecting the same type of complaint, from persons who learned the hard way not to buy anything written by Anthony Patch. 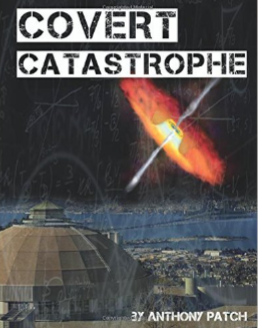 I read a sampling of Covert Catastrophe, which by the way, was given a new colorized illustration to dress up the cover on the latest edition. “Warm Fourth of July evening.” George pouring water down the front and back of his bright orange military jumpsuit. “Warm night” Jim pouring water down the front and back of his dark blue Paramedic jumpsuit. “And humid… I hate it.” Richard tucking a wet towel around the neck of his jumpsuit. “And humid…I hate it.” Paul tucking a towel around his neck, containing ice cubes from the Aid station. 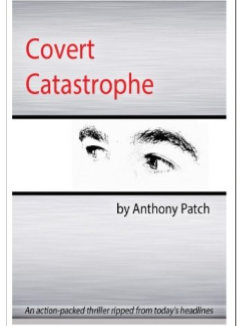 The author, Anthony Patch notes on every sample page that it is copyrighted material. I don’t think he needs to worry about anyone plagiarizing his work, except for himself. Is it possible to plagiarize one’s own writings? No, I guess not…. they just call that bad writing. Were the Men in Black worried that Anthony Patch was disclosing top secret procedures? Anthony Patch writes, “Nope. Can’t text Seals.” Lt. Casey entering the room with the remainder of their team. Richard turning at the sound of his second in command. Can’t text Seals; now that sounds like a covert catastrophe waiting to happen. But wait, I just noticed an important clue! The Amazon summary of the book has changed between the two editions! The first edition boasted, The intro to the 2015 edition has removed Written in a unique style, reminiscent of Hemingway and the late, Tom Clancy. Do you really believe that the MIB were concerned about silencing Anthony Patch’s CERN speculations? There appears to be no stopping this man on that score. Perhaps the Men In Black, who are noted for their dead, stilted manner of speech, were Ernest Hemingway and Tom Clancy returning from the grave, to silence once and for all, the ridiculous comparison of their wonderful works with the writing skills of Anthony Patch. I was browsing through a large number of internet comments on the Nathan Leal/Ted Broer story last night. Almost all of the commenters had enjoyed Nathan Leal’s past interviews on the Hagmann and Hagmann radio show. Almost all were polite, sincere, thoughtful in their use of the Scriptures, and desirous of Christian reconciliation and repentance. One person had noted that Donna Leal had said in late December that they had been threatened with a lawsuit over “fair use” . In general, Fair Use has to do with the rules which define the use of copyrighted material for commentary purposes. In such situations it is not legally required to ask the copyright holder for specific written permission, but the source must be properly credited. An example of this is the case of Nathan Leal’s audio, where he critiqued Dr. Ted Broer’s words on the Dave Hodges’ Commonsense Show and on the Hagmann Report. Portions of actual audio clips were played so that his listeners could understand what was really said, and the tone of the discourse. All main stream and alternative media news and commentary sites make frequent use of the Fair Use rules, in order to flesh out their articles. Both the Hagmann Report and The Common Sense Show also highly depend on Fair Use privileges, so it is a wonder that any legal threat against Leal would involve this particular issue. Two other commenters in the Nathan Leal discussion made mention of Steve Quayle’s January 29th post in his Dreams and Visions section of his website. This involved a dream of snakes, which Pastor David Lankford had related to him. Having lived in Texas and Mississippi since 1983, I have seen many snakes in my yard; most were harmless, some were six footers with a body having an eight inch circumference, some were pit vipers, rattlers, or coral snakes. In a few instances, my husband was forced to kill a snake for safety’s sake, by directing a sharp shovel downward to cut off its head. Once or twice we had a snake in the house, because one of our kittens had carried it inside to proudly show it to us. After reading the dream below, my guess is that we are dealing with a City Slicker who had a nightmare. It was interesting to me that a number of the polite supporters of Nathan Leal thought that Lankford and Quayle’s negative use of the term “snakes” was meant as a reference to them. Lankford says initially that these snakes were friendly to them, so that “you can even pet them”. Many of these Leal supporters had been regular listeners of the Hagmann Report, until the Leal/Broer controversy forced them to take sides. Lankford says that these snakes were all the same, but different sizes. This he interprets to mean that the snakes were the same, but had “different platforms”. He tells Quayle that “we were going to kill them”. Different platforms? You mean that some made comments via the chat rooms of Blog Talk or You Tube, or via forums or blogs? I gave a sigh of relief when Lankford had said that some were friendly to them-that would certainly rule me out as a target of this dream. Then he infers that these snakes, which were in the House of the body of Christ, were playing on Little League Teams and causing a mess. And Steve Quayle thought that this strange quagmire of anxieties was something that needed to be shared with millions of people? According to Lankford this mess is about to come to an end soon, through the use of ammunition of a lesser caliber, once he is done preaching on Jonah. Steve Quayle has the last word as always. He warns, APPLY THIS TO LATEST ATTACK ON DAVID AND I- TAKE IT TO THE LORD IN PRAYER! “SLANDER TO THE HEART” IS WHAT A BULLET TO THE HEAD IS LIKE- YOU CAN’T RECALL YOUR BULLET (SLANDER) ONCE THE HAMMER DROPS! This comment by Quayle is not part of the dream (we hope). So what was the latest attack prior to this particular dream? 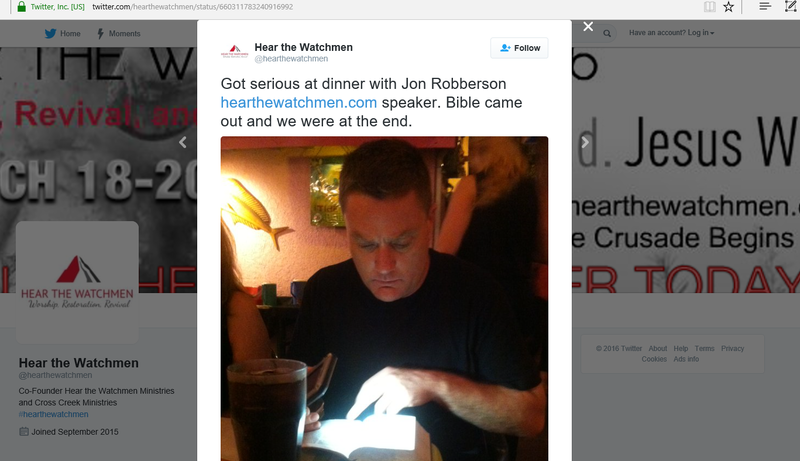 Was it John Little discussing Nathan Leal’s experience with the Hear the Watchmen conference? 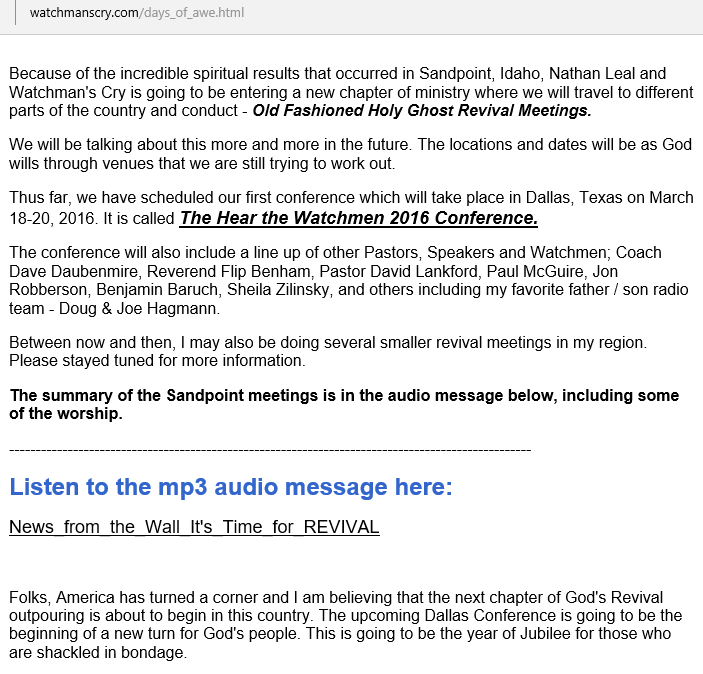 Was it Tracking the Leopard Meroz, who the day of the dream posted Cloven Tongues of Strange Fire: The Continuing Controversy of The Hear the Watchmen Conference, which made mention of both Steve Quayle and Pastor David Lankford? Was it someone who had sent them an email, asking them to repent? Let us finish this post with a link to Rebel Planet Dispatch’s Marcel Cousineau, who wrote an excellent commentary on January 30, 2016 called Simple Biblical Insight Into David Lankford’s Dream. This post displays interesting insights, and is written with a heart of brotherly love. I hope that no one would classify Cousineau as a snake in the house of the Lord, deserving of gunfire from those anointed Watchmen, Lankford and Quayle. Maybe we should all just slither away, as the low caliber bullets start to bounce off the walls. It was a dark and stormy night, when I was captured and thrown into a lonely jail cell to write my memoirs. The single lightbulb above cast a greenish hue on my orange jumpsuit which was tightly stretched over my rippling muscles and bulging tummy. I stared at the copy of the mug shot which had just been taken, and wondered what was going to happen to the handsome man with the intense eyes, Spanish Pirate hairdo, and hard set jaw. I have made mention of Pete Santilli on two occasions here, at Tracking The Leopard Meroz; once in regard to Larry Nichols, as a Clinton hit man, and the other time concerned a certain Alternative Media metals dealer. In both examples, I had to temper my remarks in light of Pete’s bad boy image and foul mouth, which he thinks are the very essence of his charm. 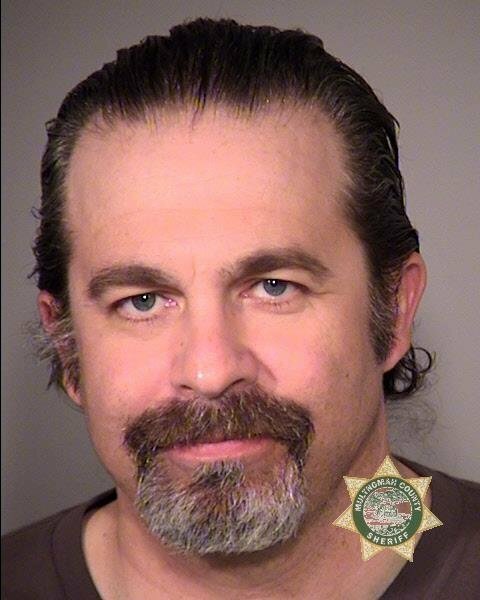 Until recently I had not followed the Oregon standoff, but when reports came out that there had been a fatal shooting, and several arrests, including that of Pete Santilli, I decided to read up on this story. Since this entire event was geared to undermine serious public discourse, I am happy to see that Mr. Santilli is now investigating himself from within a jail cell by writing an unbiased account of his own part in this Shock Jock Drama. Part of the reason why I avoid reading about ill advised protests, is that as some of you will recall, I went to college during the Vietnam era, when student led demonstrations were prevalent, but rarely instigated at the grass roots level. At that same time I also held a work-study job at the University of Washington parking ticket division, which was housed with the campus police department. When one day someone had left a poorly made explosive device under a stack of college newspapers on the counter where I worked, and it did not go off as planned, I began to ponder the fact that someone was out there who was willing to kill an innocent person for the sake of their “cause”. There are usually several facets to any story, and in many protest events, free speech and justice are rarely the real issue. And as usual, this Oregon Standoff was just another protest based on the lowest common denominator of any civilization, the golden rule of Me first-You never outlook on life. Now it has been years since I have been to Oregon, but what I remember about that state was that they had signs posted all over which read, “Thanks for visiting-but please don’t stay”. Why the current interlopers did not understand that they had overstayed their welcome, just goes to show what bad manners they have. 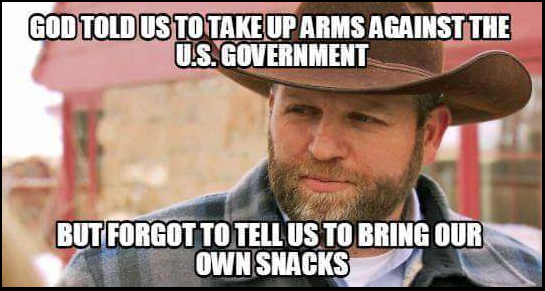 They did not even bring enough snacks to this protest, and expected others to provide for them! What nerve. 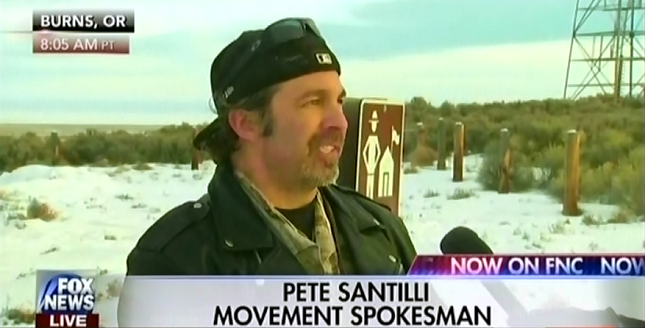 Pete Santilli, who has always expected everyone else to give him the benefit of the doubt, apparently has managed to use up all of his “benefits” in Oregon. The judge did not buy his first amendment rights argument, wherein he felt he was entitled to have Press privileges while at the same time calling for 100,000 persons to come to Oregon in order to obstruct the legally based remedies to this standoff. At the beginning, one of the focal points for the protest involved the legality of the arson charges involving the Hammonds. I see that yesterday an opposing opinion had been expressed about the hero worship of the Hammonds, in a guest column in the Missoulian, called “Learn the Backstory on Malheur Standoff” written by George Wuerthner. The author is an ecologist who has studied and written about public land issues over a long period of time. He writes in response to the false information which had been put forth by Senator Jennifer Fielder of Thompson Falls, and addresses the arson charges against the Hammonds, and the dangers which their actions created for others. The comments below this guest post are also interesting to read, as well. Perhaps Pete Santilli likes the Hammonds because they share something in common; a self serving attitude which never considers the consequences to society as a whole, let alone to themselves in the end. I have excerpted below, a portion of an article which came out yesterday by Kevin Hardin of the Portland Tribune called Pete Santilli: Free Speech Champion or Loud Mouth? It points out one of Pete Santilli’s legal fallacies. 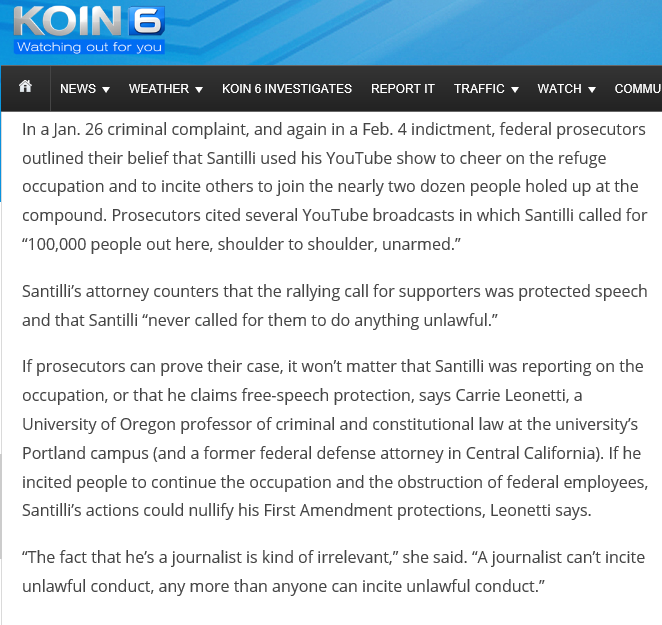 One article which sides with Santilli’s actions was posted February 2, 2016 by The Rutherford Institute called The Rutherford Institute Warns Against Government Attempts To Intimidate Journalists by Prosecuting Radio Shock Jock Pete Santilli Over Oregon Standoff. Several pages which were extracted from the January 26, 2016 affidavit given by Katherine Armstrong, Special Agent, Federal Bureau of Investigation, make for interesting reading on the documented actions of Pete Santilli, which led to his arrest. I can hardly wait for the publication of The Jailhouse Memoirs of a Shock Jock. As soon as it comes out, you can be sure I will be comparing it to the transcript of the trial, and the legal filings of Santilli’s attorneys. Hope someone remembered to bring some snacks to weather out their new ordeal.